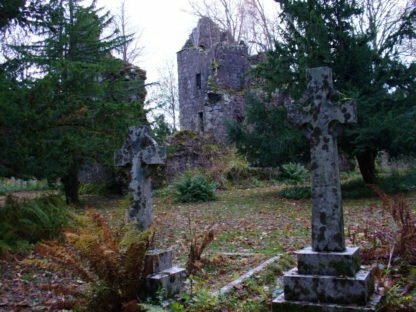 Finlarig Castle is an ancient castle ruin built in the early 17th century by the Campbell Clan and is a notable destination within Loch Lomond and the Trossachs. It is close by to the village of Killin and provides an insight into the medieval world of The Trossachs. Used as a secondary residence the castle was built close by to a prehistoric fort. The castle has an extensive history however, the time associated with Black Duncan reveal horrific stories of hangings, blood thirst and sacrifice. With links to the ancient King of Scotland, James the VI, the castle had at one time been a temporary seat of the Scottish Government. The inscriptions of initials on the castle show how the builder of the castle, Duncan Campbell, was associated to the heads of state. The castle and attached mausoleum have used within the last 100 years and anyone visiting should pay respect to the final resting place of these local people.